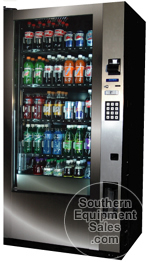 With over 25 years in the vending equipment business, Southern Equipment Sales, located near Atlanta, Georgia, has the experience you can depend upon to aid you in choosing the proper vending machine for your vending account. We specialize in providing quality new and used vending machines to: First Time Buyers, Vending Start-Ups, Small to Mid-Sized Businesses, Non-Profits, Religious Organizations, and Schools. Southern Equipment Sales wants your vending venture to be successful so we back every new vending machine sale and used vending machine sale with Free Life-Time Technical Support for as long as you own your vending machine. At Southern Equipment Sales every refurbished and used vending machine that is sold is thoroughly cleaned and every vending part is tested. All questionable vending components are replaced. Both the Coin Acceptor and the Dollar Bill Acceptor included in each used or refurbished vending machine have been rebuilt. If the vending machine is to be sold under our category 'A' style of vending equipment, the cabinet of the vending machine is sanded and painted in a satin black finish. The front of the refurbished vending machine is restyled with new black vinyl panels or in a variety of different drink machine sign faces. When completed our refurbished vending machines will look and work like new. There is a 90 Day Parts Warranty on all our refurbished and used vending machines along with our Life-Time Free Phone Tech Support on our 800 number. Our extensive refurbishing process will assure you of many years of service without incurring the higher costs associated with the purchase of new vending machines. Our inventory of used and refurbished vending machines changes on a daily basis and our website provides you with a partial look at what vending machines we strive to keep in stock to meet your vending account's needs. With deep discounts provided for freight we are not only able to serve the local Atlanta, Georgia area, but also all of North America. Whether you are a first time buyer, mid sized, or a large vendor, we are more then happy to answer any of your questions or concerns. We look forward to discussing your vending equipment needs and we value the opportunity to provide you with quality vending machines backed by a solid and reliable after the sale support system. Please contact us today! Get a jump on the heat of summer with a used cold drink vending machine for only $995.00 plus shipping. Our Assorted Soda Vending Machine Special provides you with your choice on available stock of a Dixie Narco, Rock-Ola, Royal, or Vendo category B can drink machine. A rebuilt dollar bill acceptor and a rebuilt coin changer, a 90 Day parts warranty and our lifetime free phone tech support. By combining this drink machine sale with our $129.00 Freight Special provides you with a reliable and low cost drink machine delivered to your business or vending account. Height: 72"-79" | Width: 29" - 39" | Depth: 29" - 36" | Weight: 700lbs. For an additional $200.00 you can upgrade your can drink machine to a category 'A' drink vending machine. This upgrade includes a freshly painted black cabinet and your choice of three different drink sign faces listed below. This upgrade is strictly a cosmetic upgrade and is ideal for vending locations where a new machine appearance is called for. Combination Can, Bottle, Energy Drink Vending Machines also available. Far from being an Internet start up, Southern Equipment Sales has been in the same location since 1988. Our president and owner Bob Johnson has been in the equipment business since 1965. Our head technician, Alex Varcoe has been handling all customer's technical vending issues for the last 27 years. Unfortunately, in the Internet vending business there are many companies that have very attractive web sites but not much else. They will solicit orders on vending equipment that they do not have or own. Once the sale is consummated these vending equipment companies will then attempt to find the vending machine you purchased or ship you something close to what you would accept. At Southern Equipment Sales every used vending machine we sell are refurbished by our employees in our warehouse. Every new vending machine we sell goes through a detailed 'Testing and Preping' process by our employees in our warehouse. We welcome all new potential customers to pay us a visit. We also offer free in house training on your vending machine purchase at out warehouse. You will find our employees totally knowledgeable on all of the features of every piece of vending equipment that we sell. You will also find them fully knowledgeable on all other aspects of your vending machine purchase. This includes warranties, financing, payment types, shipping, tax, and after the sale support system. Every new or used vending machine we sell includes Free Life-Time Technical Support. For example: Two years from now selection B4 is not working on your snack machine – call us. Five years from now your dollar bill acceptor in your drink machine stops taking bills – call us. This Lifetime technical support is available on our 800 phone line, Monday through Friday, from 7:30AM to 4:00PM EST. Your vending machine purchase will include two copies of your invoice. We suggest you leave one copy in your vending machine to more easily identify the type of vending machine you have if you need any future tech support. This will speed up your trouble shooting rapidly. Being at the vending machine on a cell phone, and having this information about your type of vendor, we will be able to identify your problem in minutes. We fully understand the importance of getting your vending machine back in operating order as soon as possible. All of our used Category A and B vending machines carry a 90 day parts warranty. New vending equipment warranties will vary by the manufacturer as shown on our New Vending Machines area of our website. Advanced replacement of parts is available on both new and used vending equipment. We are constantly reviewing our costs against our selling prices to be Competitive Plus. Competitive Plus means to offer you the lowest possible selling price and then give you a far superior support system after the sale. We will always meet or beat any advertised price on any comparable machine at any time.